Venus 3 -the perfect backhand solution. 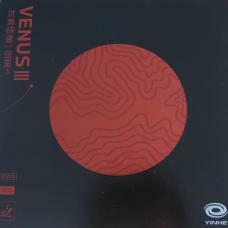 Venus 3 is a high-tension inverted rubber. This rubber is addopting the latest Yinhe`s top-sheet technology for the new 40+ ball. The sponge is soft and with macropores. The top-sheet of Venus 3 is non tacky and the rubber has very good speed.